In a perfect world I would have packed up the family in our ever-shrinking mini-van with its engine light on and traveled to Toronto for the opening of Angelina Ballerina: The Musical today, January 22 to celebrate Katharine Holabird's birthday. She is the author of the Angelina Ballerina series that is available in so many ways from books , TV shows, movies , musicals, ballet classes, online, music and merchandise . However, I decided to hope that the show comes closer to home as the U.S. Tour just began in October 2010. Katharine Holabird wrote Angelina Ballerina over 25 years ago when her children were ambitious about imaginative play and dancing around the house. Her children and "all the passionate little dancers and performers in the world" (TTLG) became the inspiration for the more than a dozen classic storybooks illustrated by Helen Craig. I would consider my daughter one of these passionate little dancers that took some ballet classes, but then tried other things like art, gymnastics, and tap dancing classes. As we read the Angelina books she recalled her dancing classes and expressed interest in starting them again. I thought that the best way (besides going to Toronto for the musical) to celebrate Katharine Holabird's birthday was to read one of her books in a dance studio followed with a little dancing. We have a community center near our house where I taught computer classes and my daughter had taken her ballet classes. Thankfully, the manager at the center allowed us to head over one afternoon this week for about an hour. When we arrived at the room my son said with great wonderment, "There is no one here. Just us!" My kids in their ballet outfits. My son insisted on wearing one too, complete with a tie! 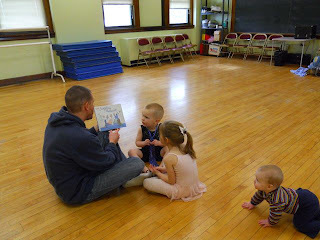 We read Angelina Ballerina, the first book in the series. Then, it was time to just dance! When I was a little girl growing up in Chicago, my birthday always came at the coldest and snowiest part of the year. Like all children, I loved birthday parties, and wanted mine to be extra special. My mother would encourage us all to dress up and play charades, and our old house was a wonderful place for games of hide and seek, but the best part was going out to Lincoln Park for a snowy birthday adventure. Every year the lagoon froze over and snow covered Devil's Hill, a gentle knoll behind the park cafe. We ran up the hill with our sled and whooped as we raced each other down. And after hot chocolate at the park cafe, we put on our skates and played tag all over the ice. A happy bunch of red cheeked party goers trudged home after dark, led by my father singing marching songs. Who could ask for a better birthday than that? Thank you Katharine for responding. We hope you have a wonderful birthday. It is chilly here in Ohio today with subzero temperatures this morning. Sounds like a perfect day for some hot chocolate and a good book instead of sledding! The Angelina Ballerina books are wonderful! I think you celebrated in a great way with your children...they certainly looked like they were having a lot of fun especially your daughter! Your children are adorable, by the way. Brilliant and sweet of you to email Katharine Holabird. Great response from her. Angelina Ballerina will make a wonderful musical show. I hope you and your family enjoy it when you see it. Hi, Eric. 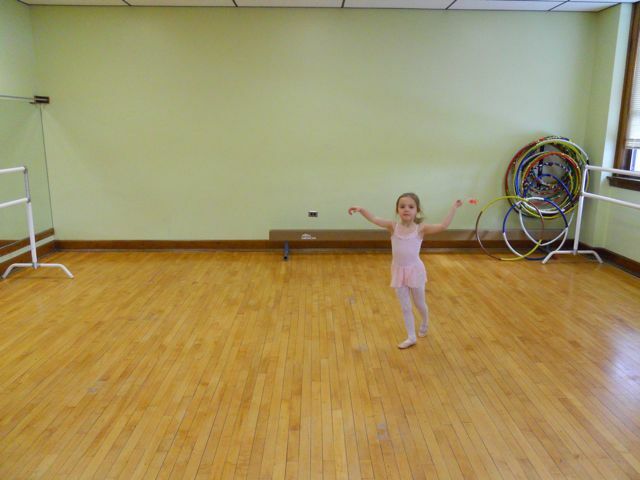 I think your idea to ask to use the dance studio was brilliant. And so cute that your son wanted to wear his ballet outfit, tie and all, too. I had to take my two girls (ages 5 and 7) to one of my dance rehearsals the other night, and they really loved being in the studio. I think all that wide open space made them feel much freer than they do at home. Looks like your guys had a great time, too! Thanks Kerry! I think it is the wide open space and mirrors that made for a fun afternoon! 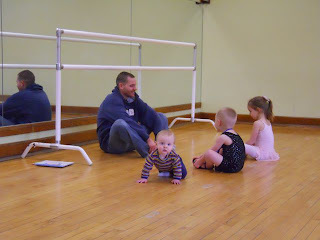 I think one day my son is going to be very upset that I posted his picture in the ballet outfit! Thanks again for including me in the Read and Romp RoundUp. 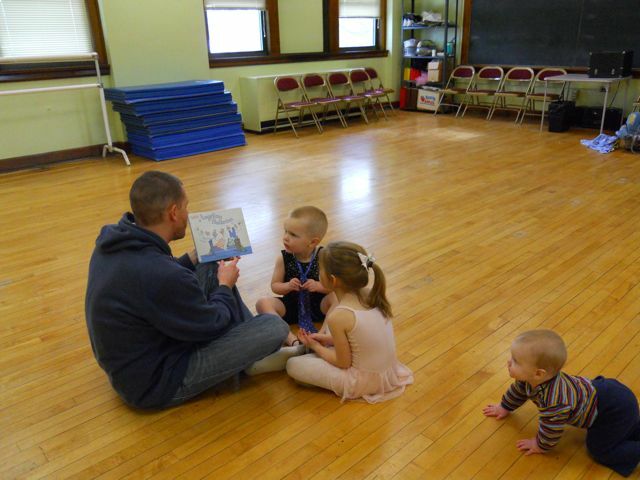 I love that you not only shared this lovely book with your child, but let her (and her siblings) have the run of the studio as well! How much fun is that ?! Brilliant idea for a blog by they way --- celebrating author and illustrator birthdays. Love it! Thanks Jacqui! 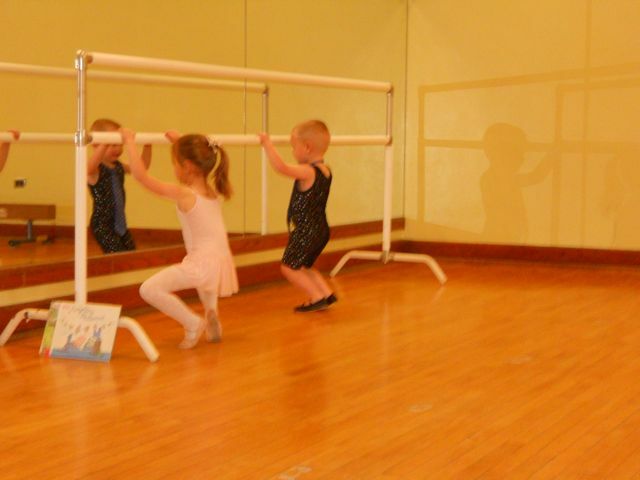 Going to the dance studio was the perfect way to bring Angelina Ballerina to life.